Snowplow 1, 2 & 3 or learn-to-skaters can be very playful with a creative coaching mind. As we all know, attention spans are very short and the best solution is to keep their feet moving and their minds off how tired they are becoming. Games such as Hokey Pokey incorporating snowplows and two foot hops are terrific exercises. Gather your group in a circle and begin singing “you push your right foot in, you push your right foot out…”, and let them shake their foot all about; end the verse with a two foot hop and you’re on to the other side! A full snowplow into the circle and back skating out completes the last verse of the song and you’ve just started developing their balance and snowplows as well as a lasting desire to come again next week. Four and five year olds love to pretend so introduce silly ideas. Pretending to have animal parades by using forward and backward swizzles along with one foot glides keeps the class moving and imaginative. Koosh balls are a great trick for the extremely timid two, three or four year old skater. Toss the soft waterproof balls out of their reach and your little skaters will have fun trying to bend down and scoop them up. This is a great way to give your beginner students the confidence and falling practice they need. Kids love stickers. Besides being used as a reward method, they can be used to demonstrate many a point to a basic skills skater. Place a sticker on the inside of their skate (usually the inside toe area) and tell them to squeeze the sticker when trying two foot glides (forward or backward). This works well with scullies also. Other game suggestions that work well on the ice are Red Light, Green Light for forward or backward snowplows; Simon Says or singing “If you’re happy and you know it do a…” incorporating any basic skills move being learned. Remember, little people want to have fun yet need to learn. Basic 1-6 levels or the non-jumpers, depending on your program structure, are the levels where skaters learn their basic turns, edges and crossovers-the vitals of skating! How to accomplish such a task and stay interesting requires a technically creative mind over silliness. Permanent markers, skateguards and the boards can be tools used to demonstrate. Drawing with waterproof markers on the ice gives the children a very descript visual. A rocking horse is challenging to trace. Three or four small circles drawn for a group of ten gives the skaters the spacing they need (2-3 per circle) to practice an outside/inside edge, three turns or Mohawks. While attempting backward one foot glides hold a skateguard in front of the torso in two hands. Have the skater think of bringing their knee up to the guard from the two foot glide position. Another exercise that the kids enjoy is balancing a pencil or water bottle on your clipboard. Use this trick for outer swing rolls, forward edges or one foot glides. See who can go the farthest down the ice without spilling! The boards are a terrific way to teach the bend and stretch feel of pumps. For example, have the group line up with their right side against the boards. Press right hip and ankle against the boards. Stretch right hand back and left in front. 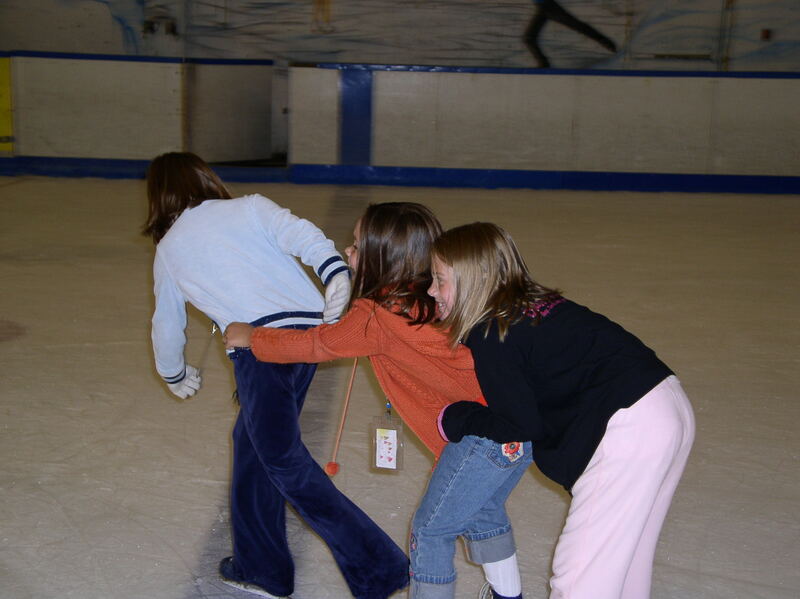 Have the Beginner skater bend their right knee over their skate while pressing their hip and ankle against the boards. Extend the left leg out to the side while bending. Repeat several times and then transfer to a circle. This should keep the skaters from doing scullies and produce real pumps instead. Relay races incorporating two foot turns, hockey stops, t-stops, one foot glides, Mohawks and slaloms are a great way to end a group and develop strong skating. Low level freestylers ready for spins and jumps can either be over anxious or timid in the beginning. Some commence Moves in the Field at this time and some a basic figure program. There are many creative teaching tricks at this level that can keep skating fun. Balancing quarters on top of the hands, placing a mitten on top of the head or stickers on the palms of the hands help control those fly away arms or the leaning over of the upper torso. Stickers again can be used for scratch spins. Place a sticker on the outer heel of the free toot in the spin. When bringing the free foot across on the scratch spin have the skater place the sticker on the outside part of the knee of the spinning leg and slide the sticker down the outside of the leg to the tight crossed position. 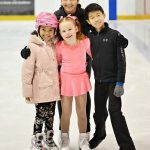 Airturns on the ice right from the start of the waltz jump or a half flip jump is a terrific way to get kids to lose their fear of leaving the ice (jumping). Start with simply rising up to the toes and down in conjunction with the proper arm positions. Have the group pair up and face each other while doing this. Then do a few two foot jumps with no turns. As the comfort and ability level increases so should the airturn. Begin to do a 1/2 turn with 8 repetitions and so on. A group of ten can accomplish this exercise easily. When introducing a sit spin have each skater put a glove/mitten in the hand of the free side of the spin. After entry the skater will take the glove and place it between their knees and have the arms extend to the sides. They need to spin three times around holding the glove with their knees. They will be in a semi-sit position. This exercise is simply to have the skater understand the closing of the inner thighs and to not lean way over with their back in the spin. It is a very challenging exercise but once again great for a group of ten skaters learning sit spins. Music, as we know, is very much a part of skating. Singing, humming or playing a variety of music can help develop rhythms or flow at this level. Back edges or the waltz eight to waltz music slows the child down and aids in the counting. Split jumps or flips to rap gets them motivated to jump high! Seasonal music once in a while, such as a scary tape at Halloween or holiday music, can uplift the attitude of a group class lesson. At low level freestyle introduce the stopwatch which will be ever so present in their skating career. Time the skater going into their waltz-toe loop jump and have them beat their time the next skate around. The advanced groups have fun with an introduction to hydro-blading. Use this to strengthen their muscles for the up and down motion of a sit spin or develop a better understanding of lean into the circle for crossovers, spirals or the tightening of an outer edge into a spin. Have the group challenge each other to see who can hydro blade the longest. For additional ideas refer to the Creative Teaching Section in the PSA Coaches Manual. May / June 1997 – pp. 13 – 14.
hello – i have a slightly different problem: my daughter started skating in october. she didn’t skate for a month bec of health problems, so that’s 4 months. she is doing snowplows; she is doing hockey stops (she has hockey skates, not figure skates); she skates on one foot (her favourite is the “superman” pose, with one knee high, one elbow pulled back, and the opposite arm thrust skyward as if she’s flying like superman); and today she decided to start skating backward. i don’t want to be one of those crazy skating/hockey/soccer moms i see all around but i also want to be encouraging and supportive and maybe guide her along a logical path of development (she really is capable of flying before she can walk!). what is the usual progression of development regarding skills? she doesn’t respond well to formal teaching styles – basically, you make a casual comment and at some point (maybe minutes, maybe hours, maybe days or weeks) she’ll just start doing it. also, there’s no problem with how tired she gets – she doesn’t get tired. well, okay, she does – after about four hours. how do i get her off the ice to take a bit of a breather or is it okay to let her decide if she needs a break or not? i should add that i’m a crap skater – the first time i went on the ice after 30yrs ended in an ambulance trip to emerg and a diagnosis of a fractured skull.